The celebration of the Solemnity of the Birth of St. John the Baptist today is unusual in the liturgical calendar of the Church. First, we celebrate John’s birth on earth. Except for the birthday of Mary Our Mother, all saints’ feast days are remembered on the day of their death. It is therefore an acknowledgement of the important role of Mary and John in the history of salvation. Second, the liturgical norm of the Church says that a celebration that has the rank of a solemnity supersedes the Sundays in Ordinary Time, thus, the readings are not the readings of the 12th Sunday. The role of John the Baptist in the history of our faith is profound and simple: He prepares the way of the Lord Jesus. His life points to Him. He said, the “One who is coming after me, whose sandal strap I am not worthy to untie” (John 1,11); the One “who ranks ahead of me because he existed before me,” (John 1, 30) and “He must increase, I must decrease” (John 3, 30). John’s role is thus to direct people to Jesus. This role, I believe is now ours. But how do we direct people to Jesus? Let me take insights from Ronald Rolheiser’s Secularity and the Gospel. First, we must know the present state of people to be effective. In ancient times, when we still had kings and queens, each year a good ruler was expected to walk around the circumference, the ambit, of his or her kingdom and bring back a report on the state of things. Our notion of a state of the union address — as presidents do — takes its origins from here. In Anthropology, it called, “walking the ambit” (inspecting the domain, the territory, the realm). All programs should be based on the present reality. Thus, it is good the engage the world. We are invited to have a certain biblical and Catholic attitude towards our world now, to love the world as God loves it. Biblically, we see that God loves us, not because we achieved it or we are free from sin, but because God is love and He cannot help it but love us. As Jesus says, “God lets His sun shine on the bad as well as the good.” Like the sun, he does not discriminate between the vegetables and weeds; it shines on all and on everything, including the sinners and the immoral. And therefore, to be like John the Baptist, we must mirror that nondiscriminatory love of God in this present world. Thus, the world today is not an enemy to be fought, but a child to be loved. A arrogant and unbearable teenager is not bad, but an unfinished work. Second, we need artists and saints. We need to re-inflame the romantic imagination within our faith. In the past years, we have plenty of good theology books on scripture, moral theology, church history, liturgy, etc. But we lack imagination! We lack the fire, the passion, the romance, and the aesthetics that pertain to faith. This is not the job of the theologian; but the work of the artist and the saint. Francis of Assisi was not a theologian or was an excellent academician. Those who follow Francis do not follow him because of the books he wrote. His greatness is in his artistry. When he took off his clothes, the gesture was artistic — To the imagination, this is what it means to live poor, to be poor: to be without the basic necessities even of clothing; to be without the clothing — the pretenses — that covers us. Even in cosmetics, there is what we call a concealer — that which hides blemishes and imperfections. To know the person, remove the make-up! Leonardo da Vinci painted the Last Supper. The supper of Jesus was not really like that, but we cannot imagine the Last Supper as da Vinci’s famous interpretation of that scene. Proof: we have this interpretation in our homes. Not that we should ban it because it was not realistic — who actually would know? —- but its greatness is in the fact that it fires our imagination, deepening our faith. Same thing with artists and saints such as Augustine, Ignatius, Thomas More, Clare, Therese of Lisieux, John of the Cross, Teresa of Avila, and Mother Teresa. How many of us were inspired by music? Who were not led to tears listening to the Ave Maria by Gounod or Schubert. Who were not led to worship in dance? Yes, including King David who danced naked worshipping God! These artists and saints inspire us. They put color to our faith. They made our faith exciting and interesting. We first fell in love with Christianity because of art and artisans. Morris West said, “All miracles begin with falling in love!” We don’t fall in love with something or someone who is ugly, boring, colorless and rigid. We fall in love because we see something beautiful. Thus, we need artists and saints: those that provide people something beautiful with which to fall in love with. These two points are being John the Baptist today. The figure in the desert, in sack cloth and eating insects; the baptism in the river and the call for repentance are artistic images that suggest the romance of our faith. Let beauty point and lead us to Christ. 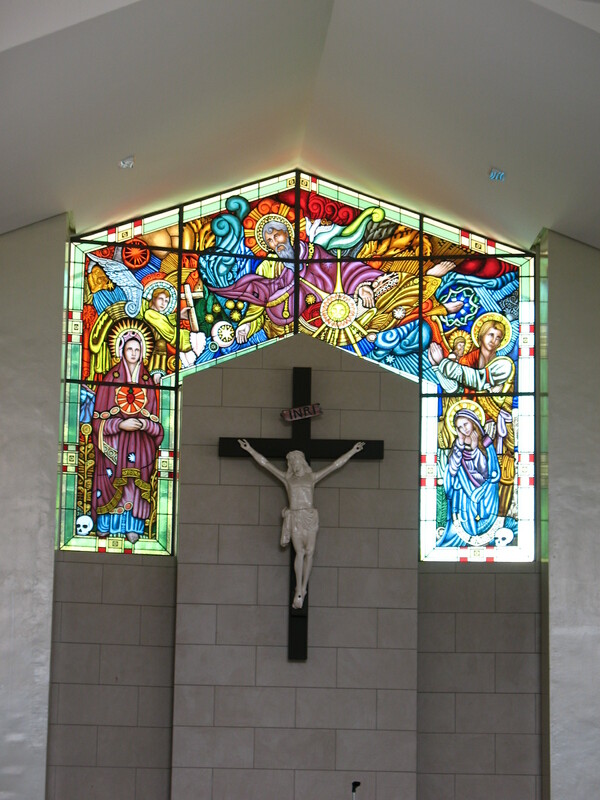 *colored glass at the Ateneo de Davao chapel.